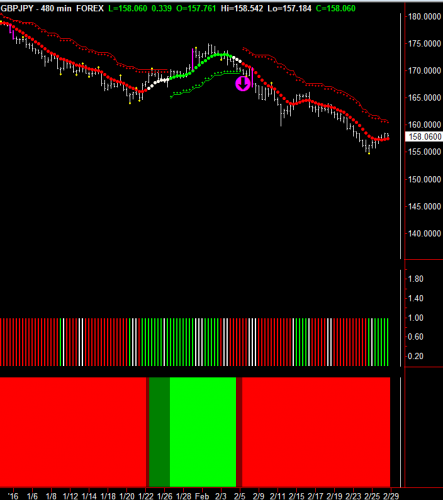 There is no better tool to trade with than Hawkeye Volume! Volume is a leading indicator, signaling the intentions of price ahead of time. You have heard it said that “Volume is the fuel that drives the market”. 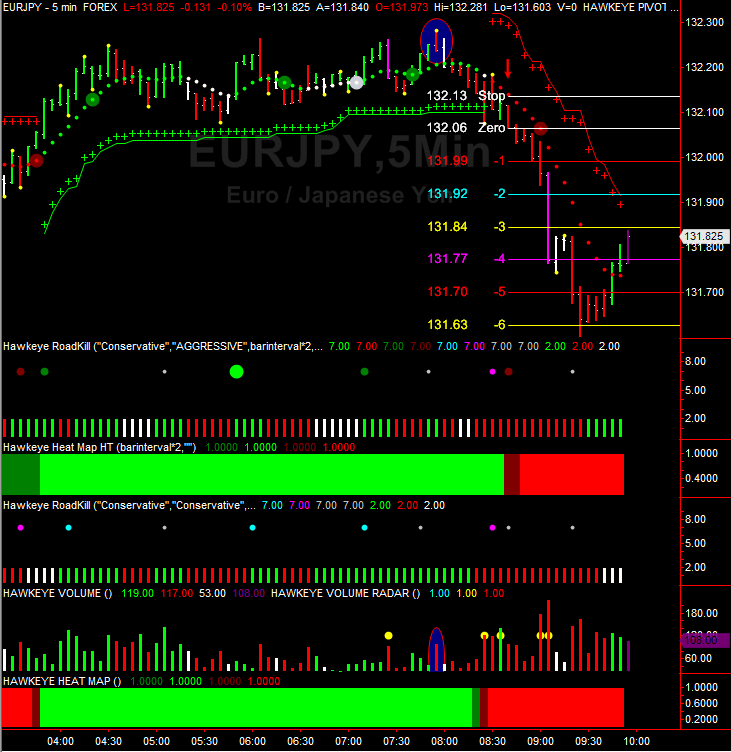 And traders all over the world gain the edge they are looking for when Hawkeye Volume is coupled with triple timeframes. 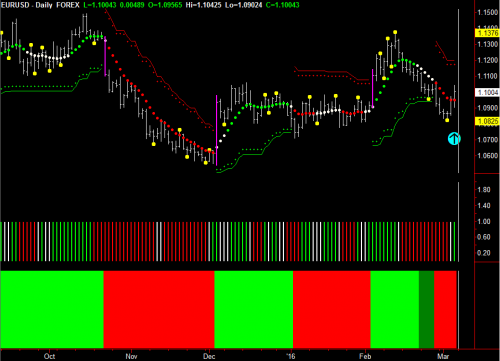 Hawkeye makes volume price analysis simple. 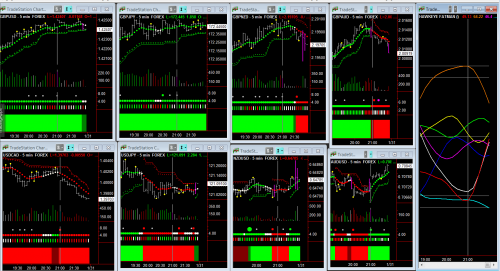 The Volume indicator shows whether buying or selling is dominating the market using simple color codes: Red shows professional selling, Green shows professional buying, and White shows no demand. In other words, it doesn’t just tell you the volume, as with other trading software, but it actually tells you whether the volume is professional BUYING or professional SELLING. Notice how just before the big price move down, that Volume signaled the intent of price way before the trend began, shown by the oval and Red price bar extension. The red bar also has a Hawkeye Pivot (yellow dot). Therefore, we expect price to reverse 3-5 price bars after a Pivot. With opposing volume however, it is a compelling signal of market reversal. On top of that, we also see a Price Action Failure, shown by the aqua box on a triple top. 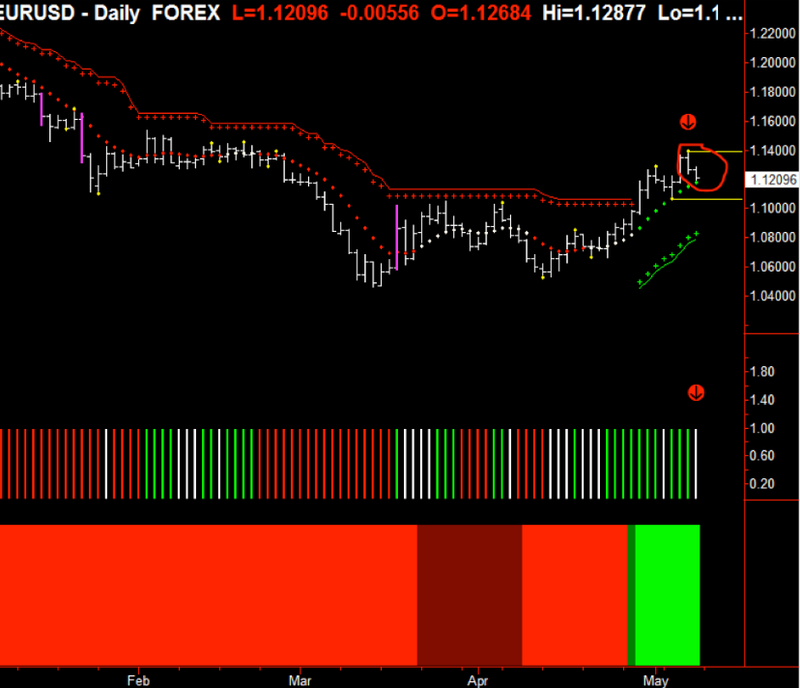 Here, volume and price are working together to signal the intent of price to make a substantial move down. The results were quite rewarding, as this example shows. 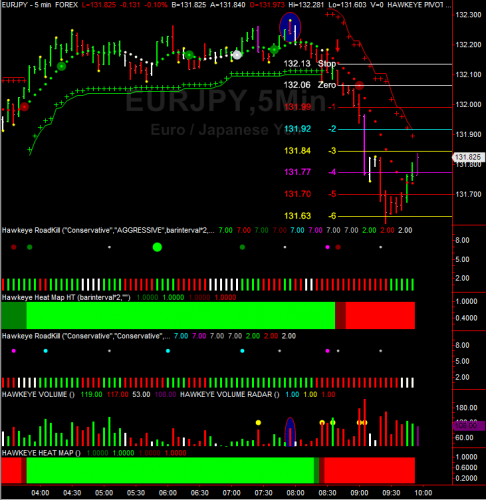 Using the Hawkeye ATR Levels tool, a 8:1 Reward:Risk value was achieved, yielding a potential +90 pip trade. Note that the entry was a standard Hawkeye setup, following our 3-Step Entry/Exit Method. Our training courses teach this Method. 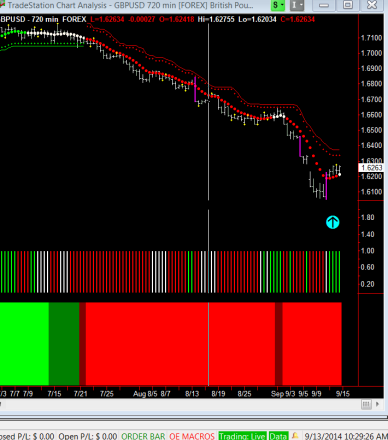 These types of setups occur every day, and Hawkeye Volume is the best at showing you this action. Don’t sit by and let trades like this pass you up. . . As a core component of all our unique indicators, Hawkeye Volume leads the way to a trading plan that can generate consistent profits daily. 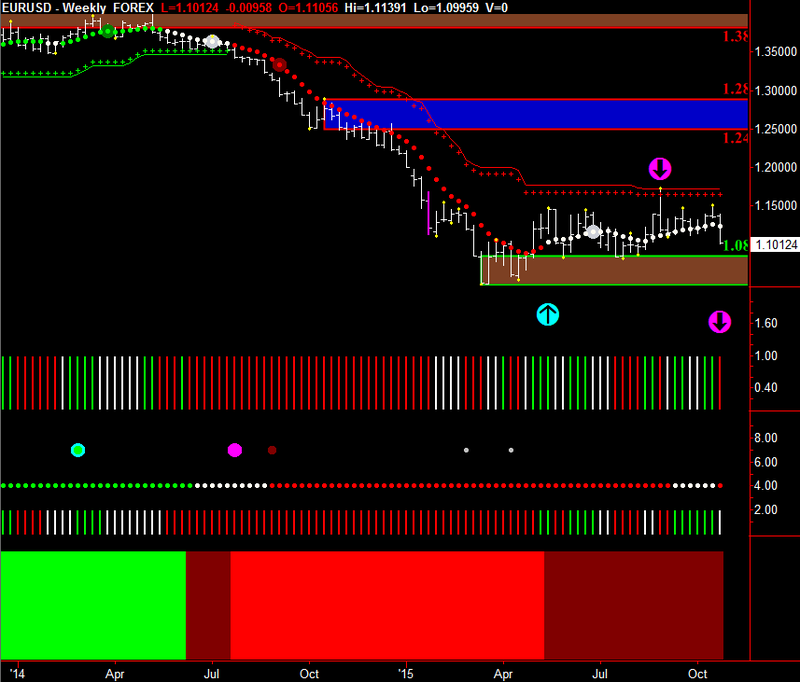 This coming week will be very important for the British Pound. Why? Well look at the Hawkeye Fatman. 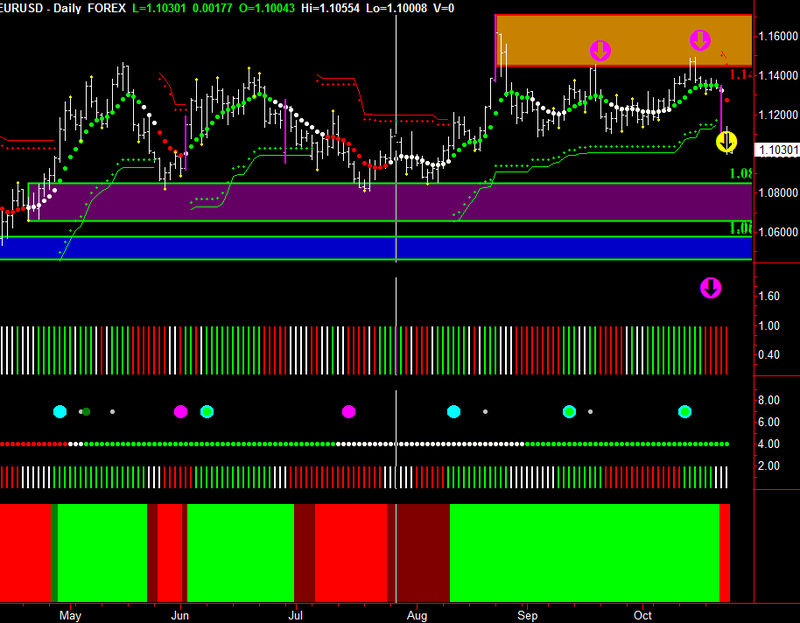 I have deleted the other currencies so we can clearly see the USD (cyan) and GB Pound (brown). 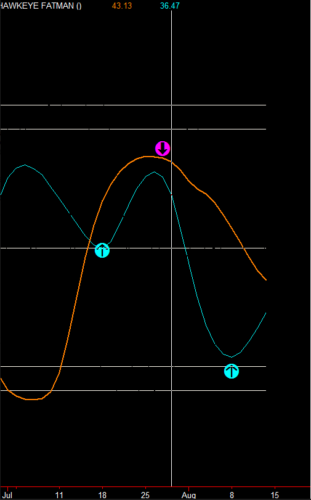 At the first cyan arrow the two currencies are trading in the same direction, followed by the magenta arrow where they are again both in the same direction. 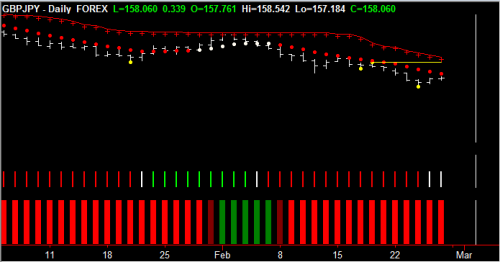 On the daily chart below this is represented by the white congestion dots on the Hawkeye Trend. 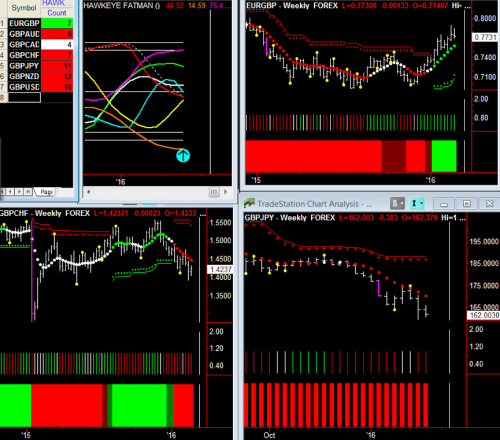 But now look at the second cyan arrow, the USD is rising and the Pound continues to decline. 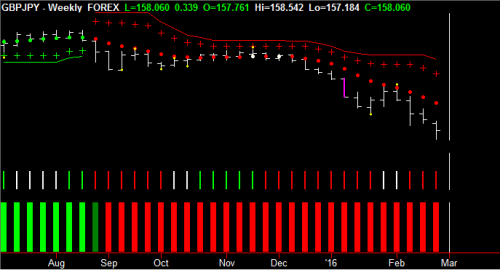 I have displayed just the volume off the daily chart shown on the middle plot, and have used the Roadkill 3-day volume on the bottom plot. 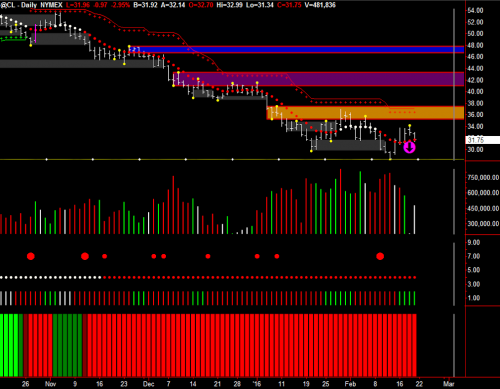 Note that the volume has shown no demand on the 3-day (white volume), reverting to selling volume on the last 2 bars. The daily volume above has 6 bars of selling. Now look at the price. The Hawkeye Trend has gone back into downtrend. I have placed a yellow line from the last major Hawkeye Pivot, if this is taken out, LOOK OUT! It is in freefall. Just before Christmas, I said that 2016 there would be a great trade in gold and that certainly is the case so far. 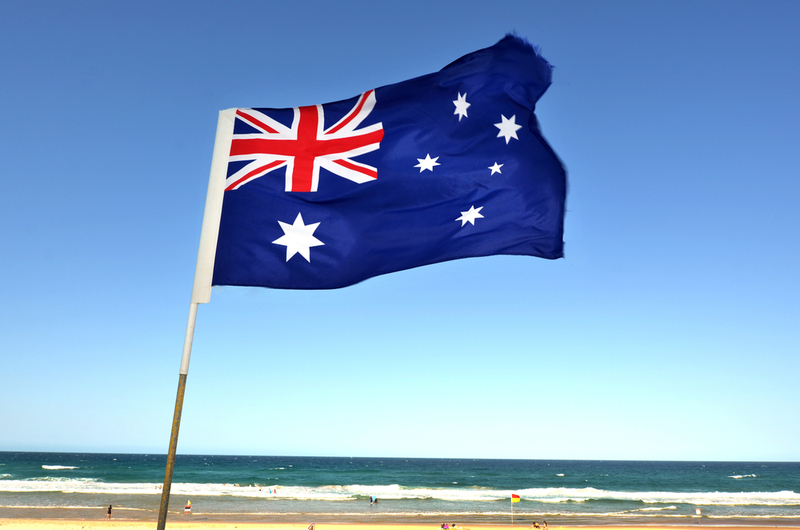 So I hope some of you loaded up on the one stock that I really like – Newmont mining, NEM. 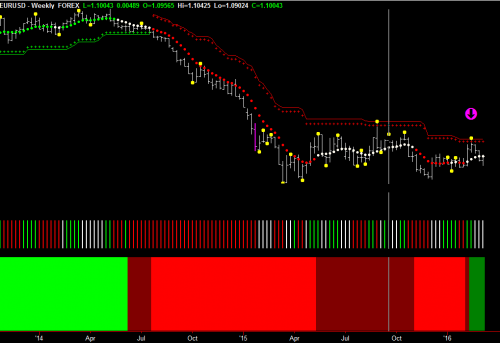 Now it’s the turn of the Euro, so get ready to say bye-bye to the Euro. Europe is in a mess, with a huge migration problem and steady discourse between member states on how to react to this problem. This ultimately, I believe, will be the catalyst that drives the Euro path as each country looks after its own interests and citizens. Unlike America, with just one central bank, each country in Europe still has its own central bank. Each of these banks can make their own decisions, which ultimately each will do. The Euro since 2008 has had a 32% decline and this is supposed to be a major currency. So let’s look at the charts as I believe we will have a great opportunity to trade on the short side. Since the beginning of 2009, the Euro has been in decline. And right now, it is entering congestion on the monthly chart with overhead resistance (where I have placed the blue line). However, if the low of 2015 is taken out, brace yourself! This market timeframe is displaying classic congestion with choppy volume between selling, no demand, and short-lived rallies on buying volume. Notice where the price went right up to (where I have placed the magenta arrow) which coincides with the Hawkeye barrier which generated a yellow Pivot. As you can see from where I have placed the cyan arrow, the price is choppy and the Hawkeye Trend dots have gone flat, signaling more congestion. We now wait for a Hawkeye Pivot high to come in, which will push the market back down. 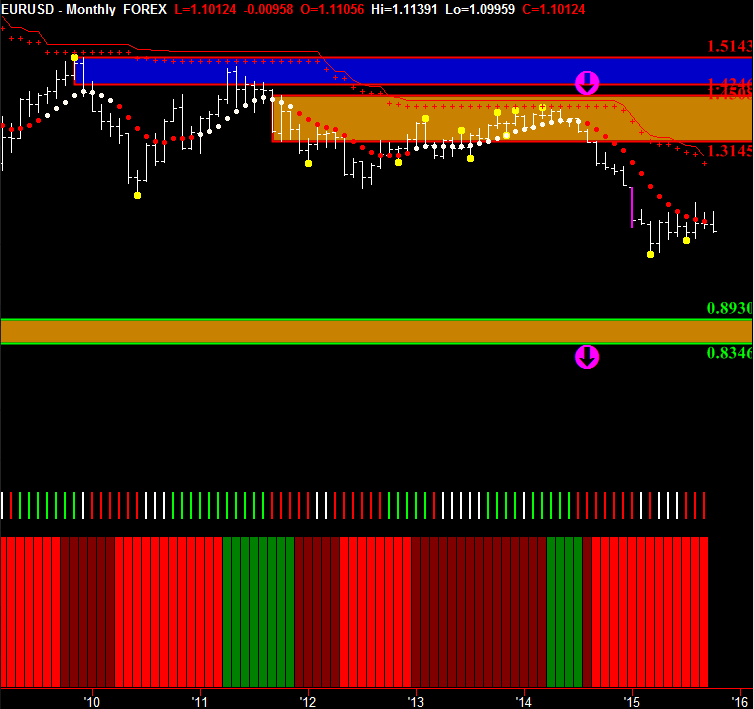 And subject to a close under the low Pivot 1.0825, congestion will end, with an exit to the downside. This will trigger our entry into this trade. Bear in mind that the other timeframe resistance and support areas must support this move. 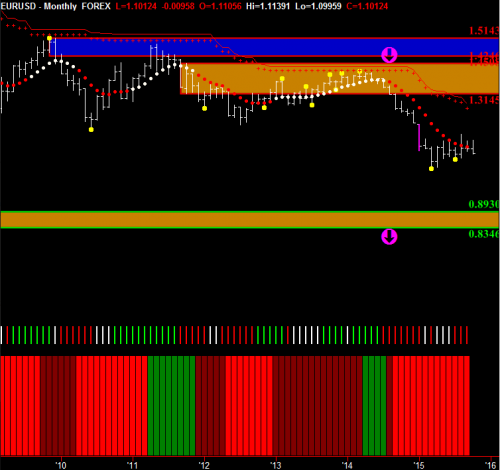 As I have with gold, I’m highlighting a position trade here which could last for several months. Eventually, I do believe a great opportunity will come our way this year. I will keep it short this week as I wish to follow on from last week that we have the opportunity in the GBP pairs for substantial gain. Do try and trade the longer time frames and hold even if it is a micro lot. If you feel you have missed the market just wait for a pullback in the faster time frame. 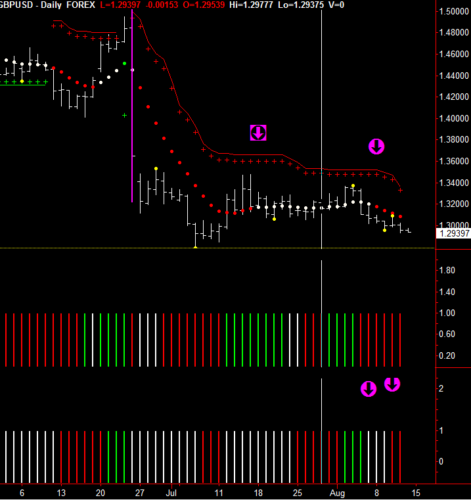 In this example below on the 480-minute (a third of a day) the magenta arrow shows the start of a downtrend. The daily and weekly charts are also in a downtrend. Wait until the 480 minute pulls back to green, then heads back to red. Now you have all three in the same direction and you can take a low-risk trade. This technique applies to any three time frame set up. I would also like to congratulate Chris T., who is a Hawkeye trader, in his first month of going live from sim achieved 386 pips. Good work! Is this the start of US Dollar strength? 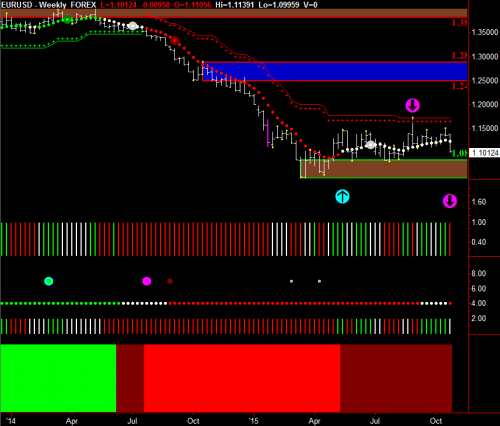 The euro had a break down on Thursday and Friday. Why? Well, Europe is a mess – with the huge number of immigrants from the Middle East, the European Central Bank hinting at more QE, and exceptionally high unemployment. Technically? 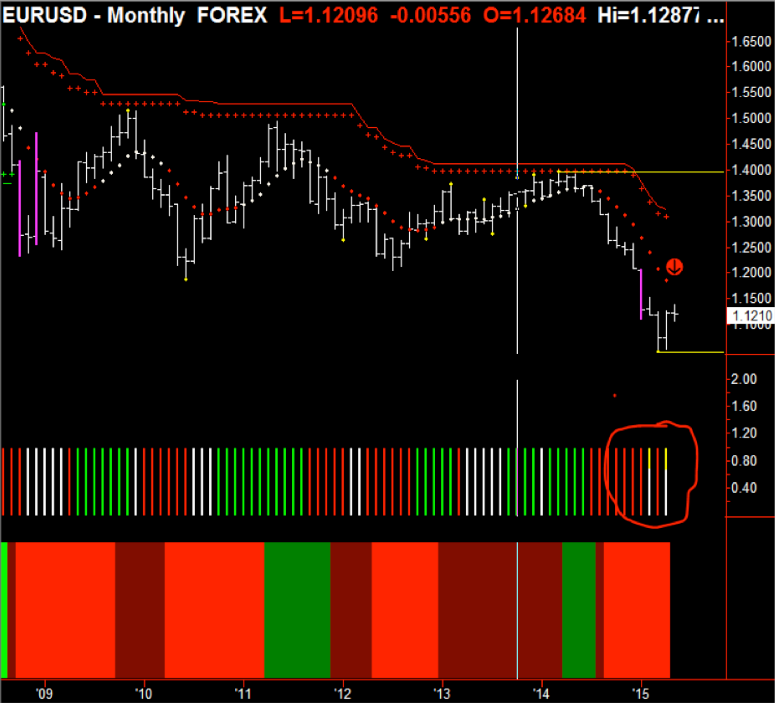 Well, let’s look at the charts, starting with the EURUSD monthly. Since July 2014, there has been selling volume (indicated by the lower magenta arrow) as price exited the Hawkeye Zones (the upper magenta arrow), red selling volume continued and Hawkeye Trend went to bearish. In the weekly chart we can see that since early August the euro has been in congestion (indicated by the cyan arrow), price went to the Hawkeye stops (indicated by the magenta arrow) – which, as I have pointed out many times, is an area of resistance. 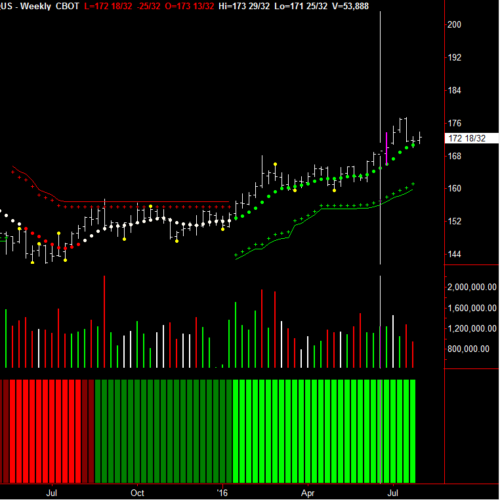 On Friday Hawkeye showed selling volume, and is now indicating a further bias to the downside. The daily chart shows us how price has tested the Hawkeye Zones and been rejected (indicated by the upper magenta arrows), volume has been short all week (indicated by the lower magenta arrow), and the Wide Bar (indicated by the yellow arrow) has been taken out with a lower close on Friday. Weakness across all time frames. Look for support at the Zone areas shown on all time frames, but a test of the monthly Hawkeye Zone area is on the cards. Understanding Price and Volume: Now that’s trading! Is The Euro On The Verge Of Collapse? What Does Hawkeye Say? If you look at the daily Fatman indicator, you can see that I have placed a red arrow at the top by the green line, which is the Euro. 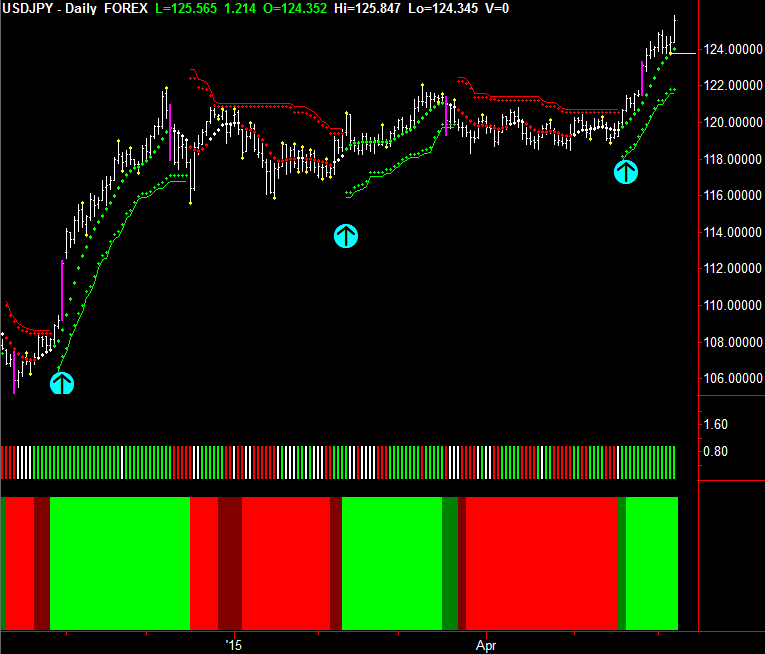 It is in overbought territory and starting to bend over, so we are expecting a decline. If we look down at the bottom of the Fatman, I have placed cyan arrows, where we can see the three currency pairs, namely the New Zealand Dollar, the US Dollar, and the Japanese Yen are all in oversold territory turning up. 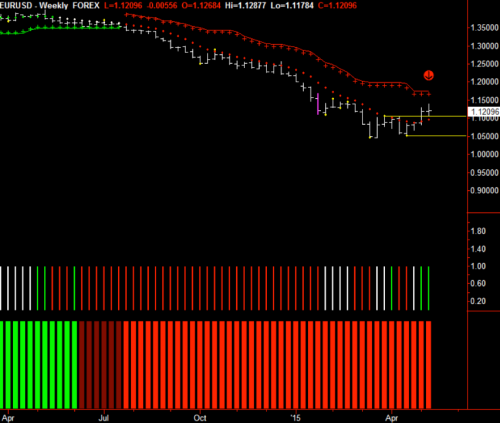 This is going to be the start of the move on the Euro to the downside when this gets underway. So, keep your eye out for this Euro move. It will take time to develop, and it should be quite a substantial move, certainly back down to the lows of 1.06, which it has tested before. 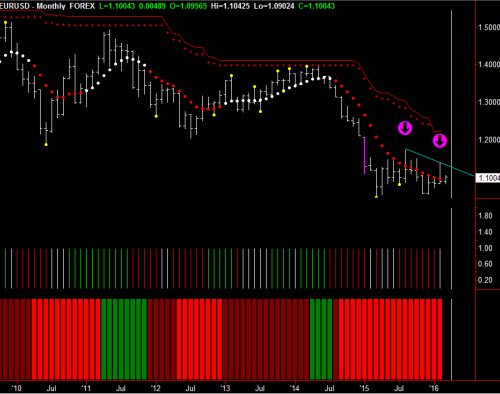 Now, if we look at the EURUSD daily chart, you can see that the daily is in an uptrend. However, on Thursday and Friday, it generated the last isolated high that I have circled with the red arrow (in fact, all the daily charts except the Swiss Franc are putting in Pivot highs). You can also see that the Trend dot is starting to go flat. It is still rising, but it’s not showing any momentum. 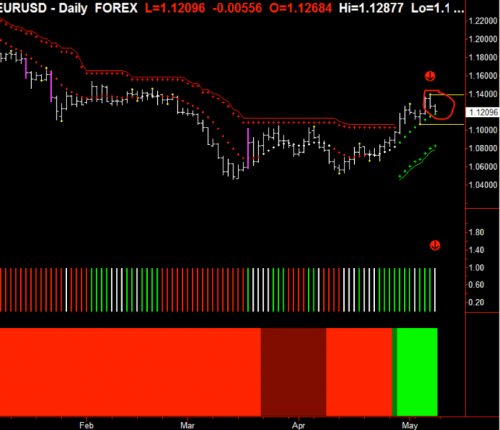 And if we look at the bottom at the red arrow down, you can see that the Volume is neutral. So, I would expect, having seen what the profile of the Fatman is, that we will see a termination of this up trend coming in this week. If we look at the weekly chart below, you can see that where I’ve placed the red arrow, we have 50% of an isolated high, the Hawkeye Pivot, which is indicated by a higher high and a higher low than the previous bar from last week. Now, if this coming week gives me a lower high and a lower low, a yellow Hawkeye Pivot will occur there, which will indicate that we are settling into a minimum of three, five, or seven bars of decline. That also coincides with the last isolated low that you can see pushed up the market three bars, which is what I would expect to see off isolated highs and lows. I’ve always said that they normally go three, five, seven bars in the opposite direction of the overall trend. So, we are on the third bar of the opposite of an overall trend, which is the trend down. And we would see this week, hopefully, that you get that isolated high, the yellow dot comes in at the end of the week. 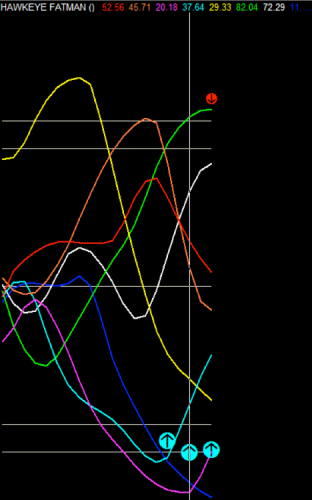 The Trend dot would also go flat indicating that there’s no momentum in that uptrend at all. 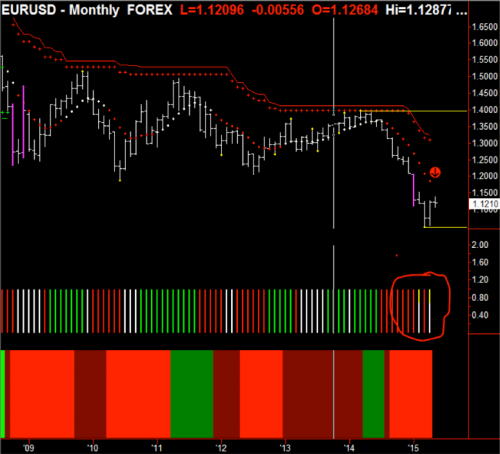 Now, if we come to the monthly chart, you can see that I’ve placed a red arrow on the current bar that’s being built. As it is at the moment, that is 50% of an isolated high. Again, in other words, it has a higher high and a higher low than the previous bar. 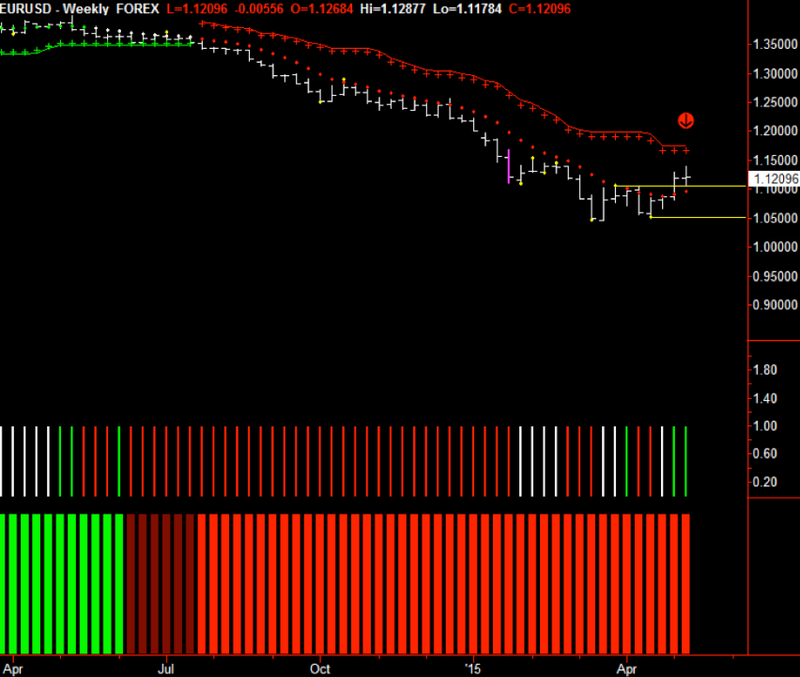 So, if next month is a down bar, that again will print a yellow Hawkeye Pivot on that bar. Also, if we look at the Volume, which I’ve circled at the bottom, you can see that it goes red, no demand, red, no demand. 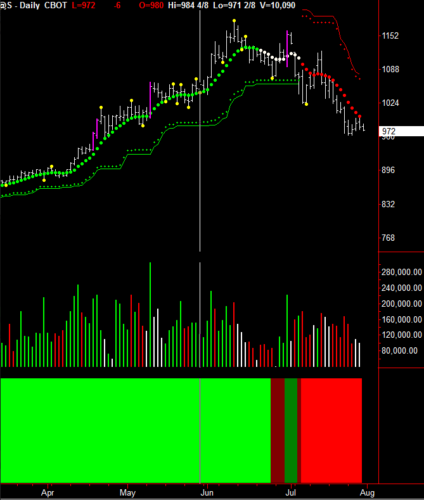 Again, showing us that there is no demand for, or buying volume, in this up move that’s coming in. So, in conclusion, we’ve had an up rally in the daily, which looks as if it’s stalling out and reverting back down onto the weekly and the monthly direction of the Euro. The Fatman on the daily also shows that the Euro is solidly overbought and a decline is expected. Always use caution, wait for the perfect shot, wait for the setup and you will be successful. Summary: The GBP may see huge swings this Friday after the result of the Scotland independence vote is announced. Hawkeye Traders will hold two special live trade rooms hosted by our Founder, Nigel Hawkes. We encourage you to attend these FREE live trade rooms on Friday to help you profit from this momentous event, which will certainly move the market dramatically. The first room will open for one hour starting at 0800 UK time (3:00am Eastern). The second room will open for one hour beginning at 1300 UK time 8:00am Eastern). Later this week, on Thursday, September 18th, the Scots will vote whether to become independent from the UK. Then on Friday, the results will be announced, and as a result, we are expecting a huge trading opportunity will be available to smart traders. 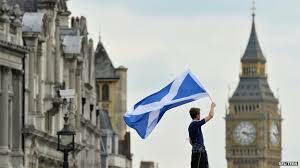 If Scotland votes for independence, it will have huge ramifications, both socially and financially, to Great Britain. That’s because Scotland accounts for 8% of the population, and thus, about 8% of the tax revenue. So, if they vote to leave the UK, it will mean a significant financial hit to the UK that will hurt their current efforts to reduce the deficit. Various economic experts are predicting that if Scotland chooses independence from the UK, it will have an effect of about 10% on the price of the British Pound. So, either way, a huge swing may happen, and thus, there’s a HUGE opportunity for us to profit. That’s why I will be holding a special set of FREE trade rooms on Friday, and I want you to attend. The purpose is to look at the opportunities that are arising in trading the pound. Now, let’s look at some of the Hawkeye charts to see how things are building up to this momentous trading opportunity. 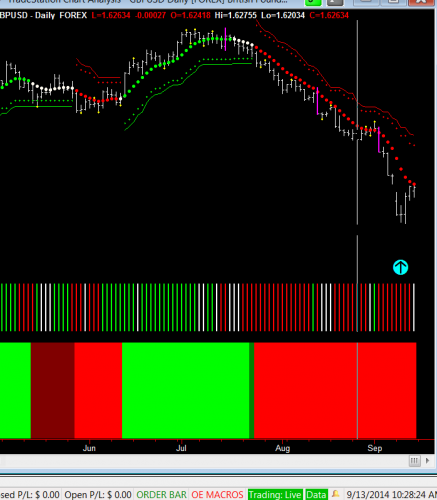 In the monthly chart, notice where I’ve placed the cyan arrow. 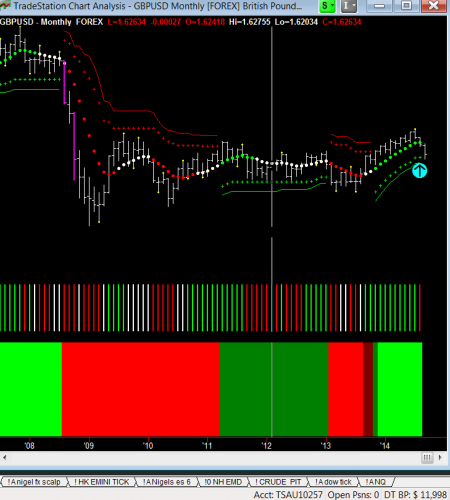 After posting an isolated high (marked with the yellow pivot dot), we see a price drop of several bars. This is very typical. 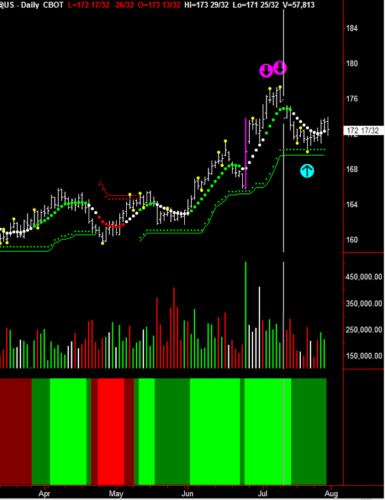 You’ll also notice how prices are finding support at the Hawkeye stop, which are the little green crosses. And finally, I want you to notice how last month, red selling volume has arrived (as shown by the red bar under the cyan arrow). 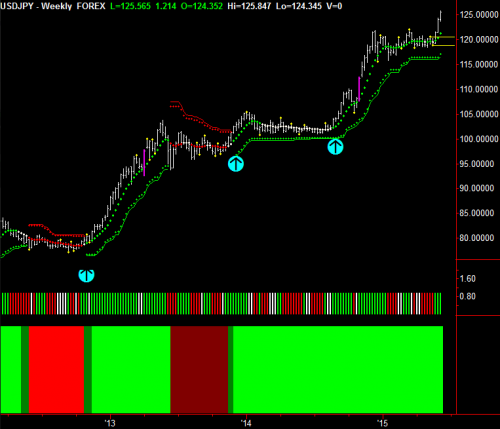 However, the actual price bar is not showing extreme weakness. I would have expected a wider ranging bar here, pushing down with this fundamental news. 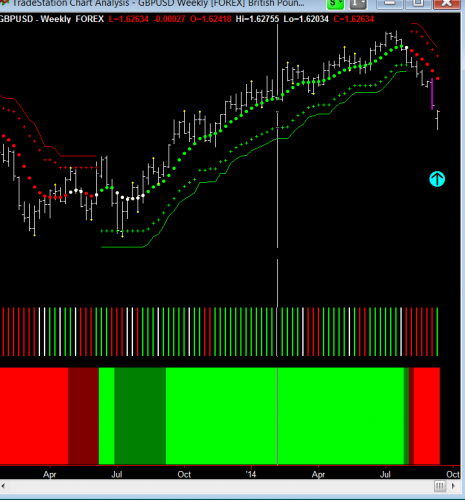 But it has found support where the stops are on the monthly chart. 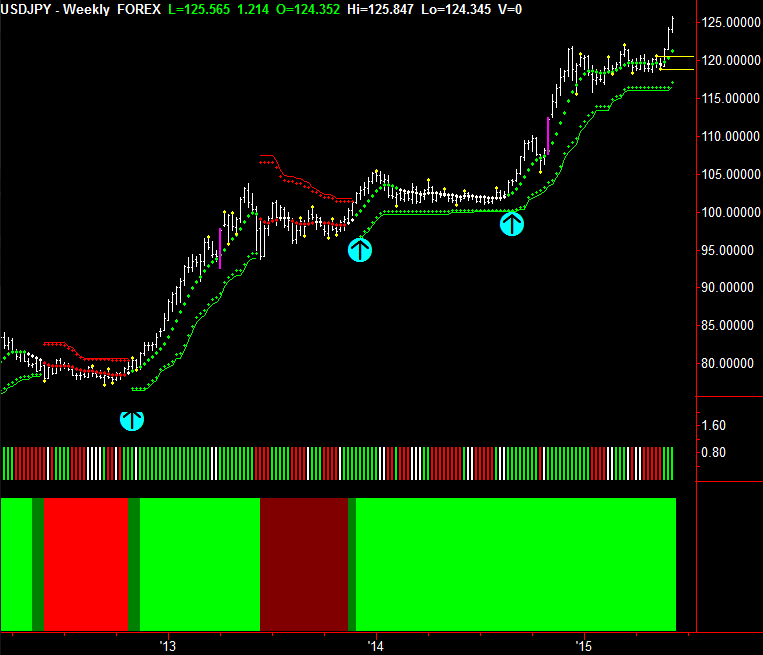 Next, let’s look at the weekly chart. Notice what happened at the end of the week on Friday. 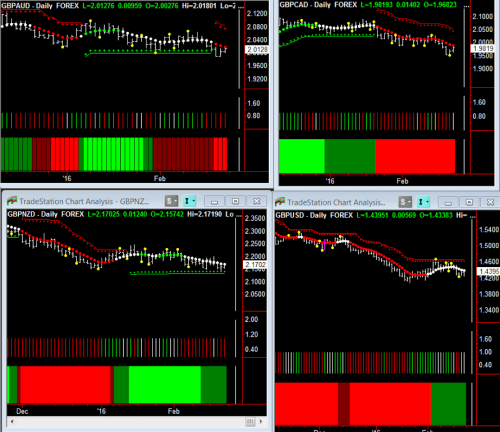 Green volume came in (green bar down below the cyan arrow), and we have 50% of an isolated low here. So, next week, if prices go up, you will have an isolated lower there, which will in turn, will tend to push this market up. Now, let’s look at the Daily, and as you can see, we have a wonderful little doji (where the cyan arrow is) which is pushing prices up. 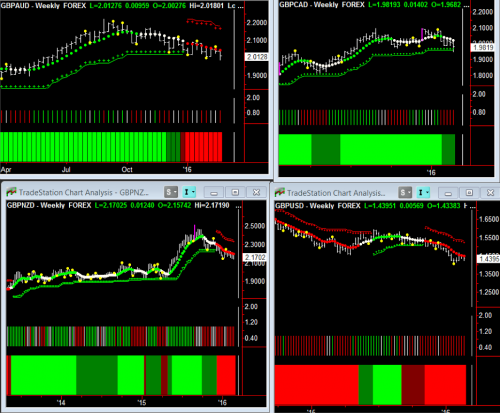 And you can also see how the trend dots are starting to go flat, which means, we have entered congestion. Next, let’s take a look at the 720 minute. You’ll notice how we have a wide bar. 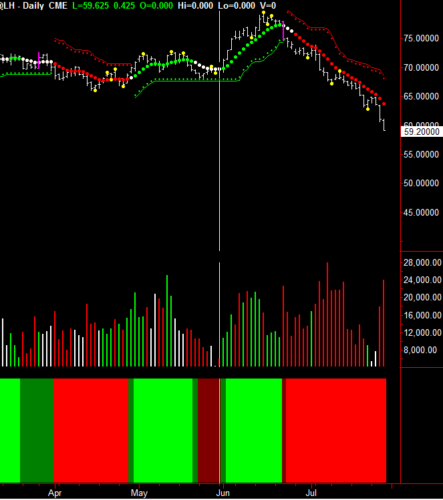 But we also have green volume coming in where my cyan arrow is (pushing this market up). So, we are in congestion. Finally, if we look at the weekly chart of Fatman, we can see that the orange/brown line, which is the Pound, has reached its over-sold zone (as marked with the cyan arrow). And you can see that the US dollar (the cyan line marked with the red arrow) has also reached its over-bought zone. Both are indicating that this trend run has come to its congestion area, and it should start turning around and start going up. 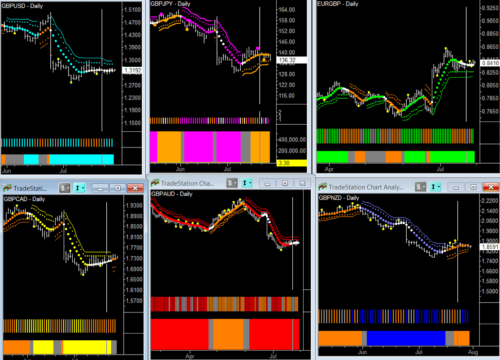 You can also see that the other currencies, particularly the magenta line (Yen) is starting to decline as well. So, that could be a very good pair as soon as the British Pound starts to rally . 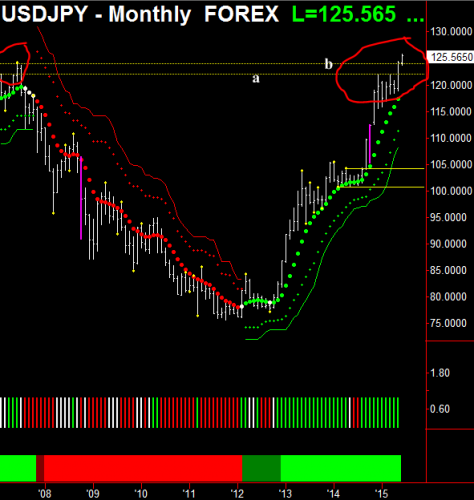 . . to look at the Pound/Yen as a pair to trade. All in all, it’s showing us that the market move to the downside has taken place. The market is going to sit back and congest until the news comes out this Friday. So, please come to our FREE live trading rooms this coming Friday. 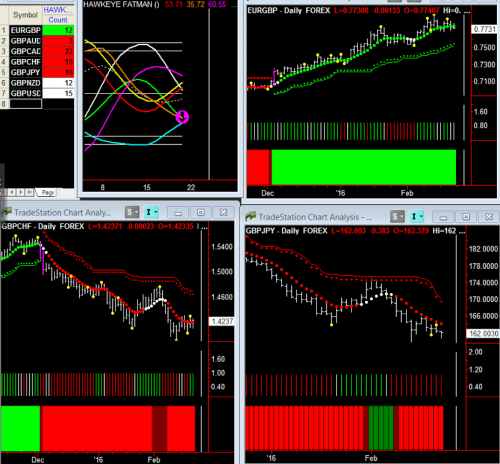 Start nailing Forex trading now!